Current legislation, The Regulatory Reform (Fire Safety) Order 2005, applies to all workplaces regardless of the number of employees and requires employers to provide adequate training in fire awareness for all members of their staff. Our online fire safety training course is aimed at all employees to assist them in identifying and reducing the risk that fire presents in the workplace. This course will provide candidates with a general understanding of basic fire awareness including what should be done in the event of a fire, how to prevent a fire occurring and a basic introduction of the protocol of extinguishing a fire. It is a cost effective way for employers to fulfil their legal obligation to provide their employees with the necessary understanding of fire awareness. The course consists of 5 modules with questions at the end. You are given the chance to review all your answers at the end of each module before final submission and you will be given 3 attempts at each module to achieve a pass rate of 70% or higher. This course covers the same content as the Basic Fire Safety course with additional content tailored specifically for employees that work in care homes. Fire marshals (sometimes known as fire wardens) are civilians trained to assist in emergency fire evacuation procedures at businesses and other organizations. It is a legal obligation that workplaces must have a sufficient number of fire marshals to deal with fire emergencies. This course provides extensive knowledge of fire prevention, evacuation protocol and using fire extinguishers. The course consists of 16 modules with questions at the end. You are given the chance to review all your answers at the end of each module before final submission and you will be given 3 attempts at each module to achieve a pass rate of 70% or higher (except module 16 which requires a 100% pass rate). This course covers the same content as the Fire Marshal course with additional content tailored specifically for employees that work in care homes. The course consists of 16 modules with questions at the end. You are given the chance to review all your answers at the end of each module before final submission and you will be given 3 attempts at each module to achieve a pass rate of 70% or higher (except module 16 which requires a 100% pass rate). 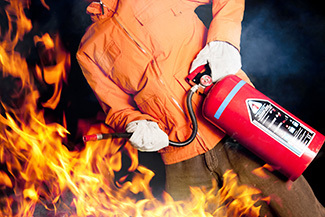 This course provides training in the use of different types of fire extinguishers and the protocol of tackling a fire. You are given the chance to review all your answers at the end of each module before final submission and you will be given 3 attempts at each module to achieve a pass rate of 70% or higher. School of Hygiene is managed by Ilknur Bulbul who is an experienced Food Safety Consultant and a licensing trainer working within local authorities and commercial organizations as well as local councils.